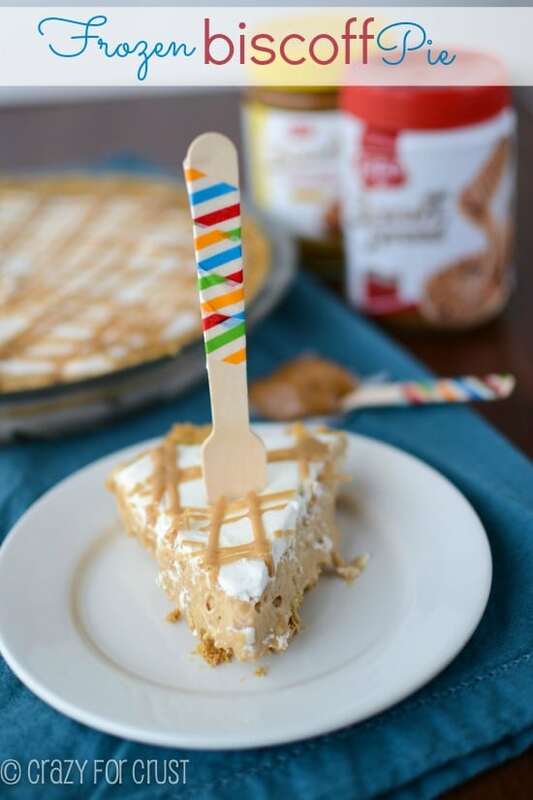 Thanks to the sponsorship of Biscoff, I am able to bring you your new favorite summer dessert: a Frozen Biscoff Pie! A white chocolate, Biscoff, graham cracker crust is topped with a frozen Biscoff filling for a cool way to enjoy your favorite spread! Please tell me you have experienced Biscoff at some point in your life. Really, I don’t think that life is complete without a spoonful or 100 two of this amazing spread. I can remember, as young as teenager, flying on Delta airlines and eating Biscoff cookies. We didn’t fly often, but you can bet I wanted to fly Delta whenever we did because those cookies were the bomb. I thought they were just travel cookies; I didn’t know you could actually buy them in real life. Fast forward several years to my blogging life. I kept seeing posts about something called Biscoff. When I realized that Biscoff was a spread made from those beloved in-flight cookies I ran right out and bought the first jar I could. It was love at first spoonful. Which is why I’m telling you – if you’ve never had Biscoff you must get some. SOON. And, you guys. They have a creamy and a crunchy version. The crunchy version has chunks of cookies inside. Really, it blows my mind a little to think about it. 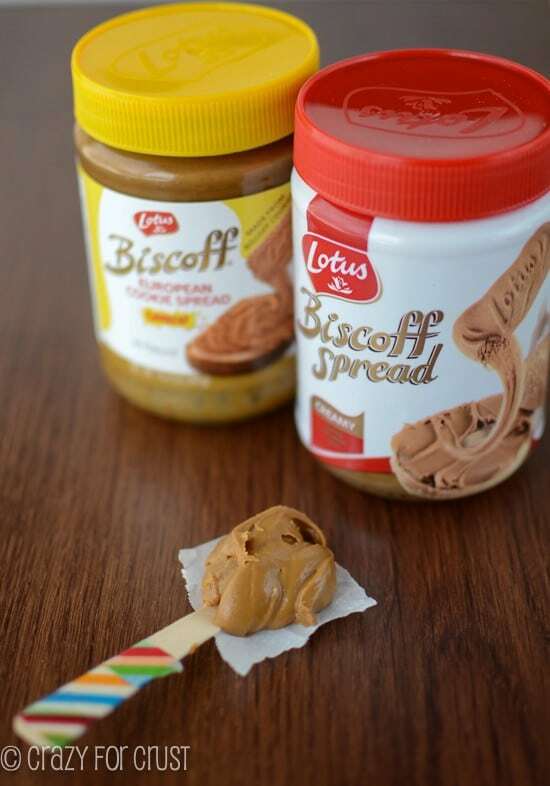 Because Biscoff is a spread made from Lotus Speculoos (Biscoff) cookies, it’s nut-free. It’s also vegan and made without any unnatural ingredients, so it’s perfect for those with allergies. I love eating Biscoff with a spoon, on toast, or putting it in banana bread. And now? Now I put it in crust and in pie filling. This pie is amazing. Like, to the astronomical degree. Let’s talk through the components, okay? The crust is made of graham crackers, butter, white chocolate, and Biscoff. I read recently in Cooking Light Magazine that using white chocolate in your crust (and cutting down on the butter) cuts down on the fat. Pretty cool, huh? Biscoff and white chocolate really belong together. It’s a flavor pairing must! 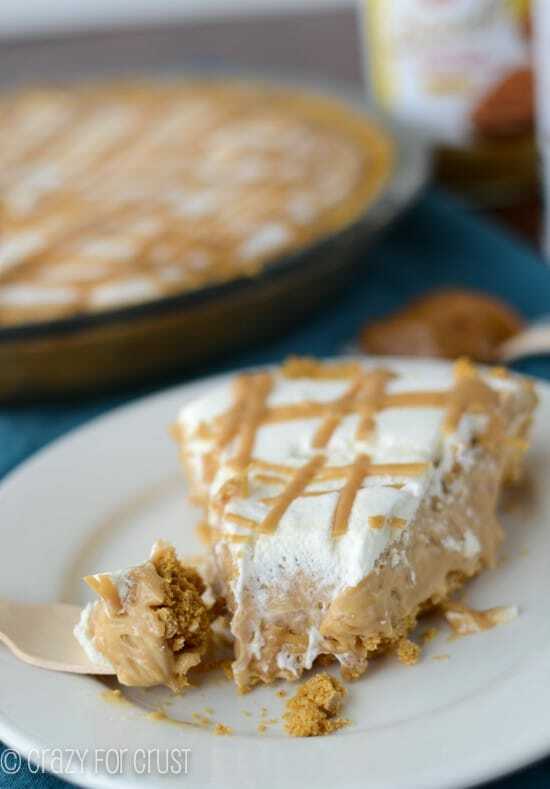 The filling is a combination of sweetened condensed milk, whipped topping, and Biscoff. You can use either creamy or crunchy in any of this pie. Use whatever you like! Then the pie is topped with more whipped topping and some swirls of melted white chocolate and Biscoff. Then it’s frozen, which is perfect for this summer heat. So, pretty much, this pie has Biscoff in every bite. This is one of my favorite pies yet! I should know, I ate two slices. 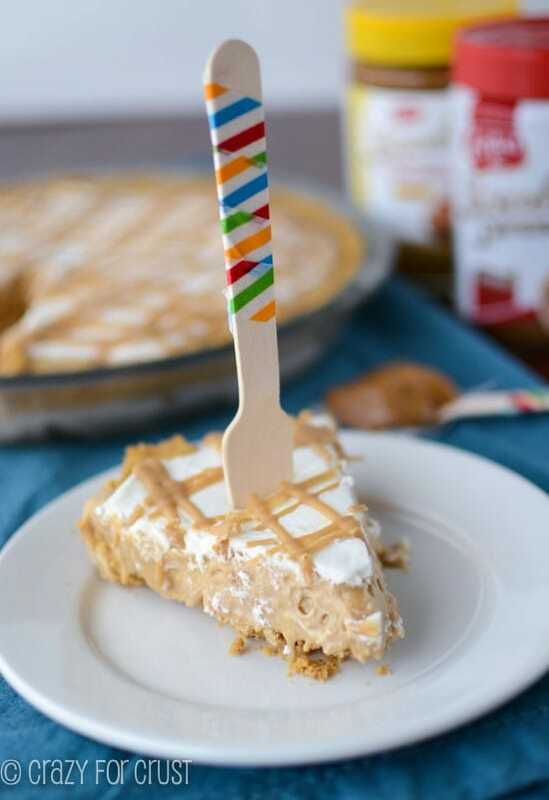 This Frozen Biscoff Pie has Biscoff in every bite! It's the perfect summer dessert. Preheat oven to 350 degrees. Melt white chocolate, butter, and Biscoff together in a microwave safe bowl for about 45 seconds - 1 minute. Stir until smooth. Stir in graham cracker crumbs. Press into a 9” or a 9.5” pie plate (the crust will be thick). Bake for 8 minutes and then cool before filling. Place 1/2 cup Biscoff in a microwave safe bowl. Heat for 20 seconds (you don’t want it too hot, but you want it to be easy to stir into the rest of the ingredients). Stir in sweetened condensed milk. Reserve 1/2 cup of the whipped topping and place in a bowl for the topping. Take the rest of the whipped topping and fold it into the Biscoff/sweetened condensed milk mixture. Pour mixture into prepared crust. Top with reserved whipped topping. It will be a thin coating of topping and it may not reach all the way to the edges. Melt white chocolate and biscoff together in a small microwave safe bowl. Pour into a sealable sandwich bag and snip of one corner. 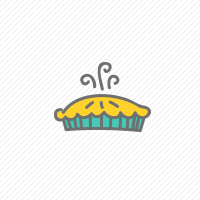 Pipe as desired onto the top of the pie. 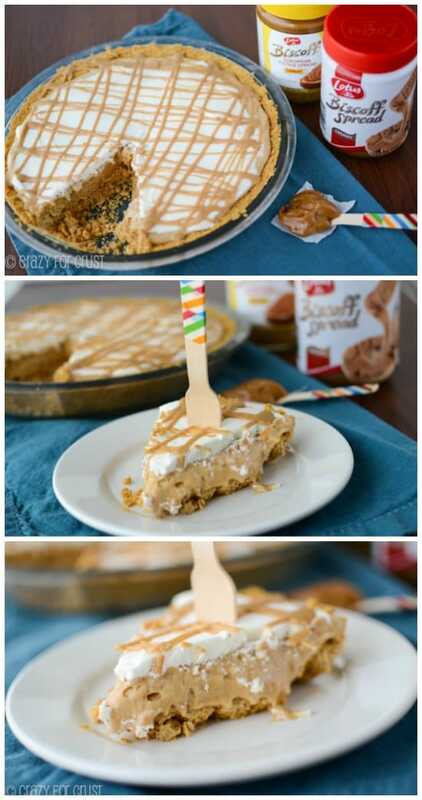 Freeze pie for at least 4 hours or overnight before slicing.